(CNS): Four of the women who are part of a wider campaign to keep the West Bay Road open have turned to the courts in an effort to stop the imminent closure of the road they say has been in use for over 100 years. Using the bill of rights and the constitution to make their case, they also claim that the governor, the attorney general, the minister with responsibility for roads and the National Roads Authority will breach a number of laws including the National Roads Law, the Crown Lands Law and the recent amendments to the Public Management and Finance Law if they continue with the proposed plan to close over 4,200 feet of the highway running parallel to Seven Mile Beach between Governor’s Way and Yacht Drive. Alice Mae Coe, Annie Multon, Ezmie Smith and Betty Ebanks filed the writ on behalf of a mixed group of activists that are opposed to all, or elements of, the government’s proposed deal with the Dart Group, known as the ForCayman Investment Alliance. 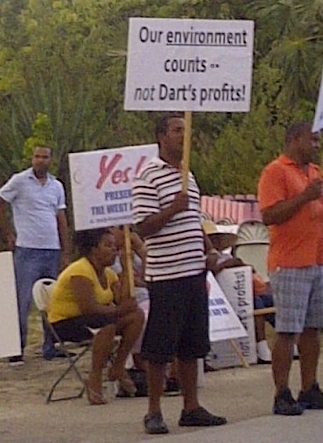 The suit was filed in the Grand Court on Monday and deals with what is known as the NRA agreement, a controversial deal signed by the NRA, the former UDP government and the Dart Group in December 2011, part of which includes the closure of the West Bay Road to facilitate the development of a new resort on the former site of the Courtyard Marriott. The women are taking the action under Part 1 of the Cayman Islands Constitution which is the Bill of Rights. Section 26 of the bill states that anyone can apply to the Grand Court if they believe government has breached or threatened their rights and freedoms and allow the courts to make a determination. In the 22 page document the women point to a number of issues they believe make the NRA agreement unlawful and are seeking a declaration from the court on their various claims with the hope of putting a stop to a closure, which, according to comments made by the premier last week, could happen by Thursday of this week. The ultimate goal is for some 4,250 feet to be closed to vehicles in the coming weeks as more of the Esterley Tibbetts Highway Extension is completed by Dart, but government is hoping to close over 1,000 feet running past the public beach by the end of this week to facilitate a planned upgrade to the beach before Easter. The women have filed a statement of claim that covers a wide number of issues, from what they describe as the failure of the governor to follow the requirements of the Crown Lands Law, the easement rights regarding the West Bay Road, which has been in use as a public thoroughfare for more than 100 years, the failure of government to demonstrate value for money, the secrecy surrounding the deal, the efforts by Cabinet to circumvent proper lawful processes and, they claim, the illegality of the NRA being able to even sign to the deal in the first place. The plaintiffs claim that under section 19 of the Constitution “the first defendant, third defendant and fourth defendants have not acted lawfully, have acted irrationally and have not be procedurally fair in agreeing to” the roadclosure and giving the land to Dart and “have abdicated their statutory and constitutional duty in doing so”. The women say they are seeking declarations from the courts to this effect and a declaration that the agreement as a stand-alone contract is flawed and beyond the powers of those involved to make. The plaintiffs also claim that the first defendant has breached section 18 and 31 of the Constitution and seek declaration to that effect as well. The document also discusses the cultural loss to the community, given the historical significance of the road and the fact that it remains the only stretch of Seven Mile Beach that still provides a view and access to the famous beauty spot. The women state that all of them have used the road for more than fifty years and that it is common knowledge that the West Bay road has been in use as a right of way for the people of West Bay and others to the rest of Grand Cayman and vice versa for over 100, years starting with horses and donkeys in the 19th century, without interruption until the present day. They say they are bringing the proceedings on the basis that the agreement and the way it is being implemented is unconstitutional for a numberof reasons. The women point to the fact that the country’s parliament, and by inference the people of the Cayman Islands, have never been fully informed of the details of the agreement to close the road and have it absorbed as part of Darts beach front property. They say that value for money has not been demonstrated to the public nor has an independent review of the agreement been published publicly, despite being completed many months ago. All of this, they say, contradicts the requirements of the framework agreement that Cayman signed with the UK and is now in the Public Management and Finance Law but they also state the secrecy about the deal is unconstitutional. (CNS): The People’s Progressive Movement has announced that Captain Bryan Ebanks will be standing on the party’s West Bay platform in May,joining Woody Da Costa and Ray Farrington. Given the recent turn of events, the opposition believes that the long running hold that the former premier has had on all four seats in the district can be broken and will be going into battle to ensure that, if that is so, the seats go to their candidates. The PPM has said it plans to field four people in the district, which will be the toughest battleground for the Progressives, but a fourth candidate has yet to be named. Captain Bryan said it had been too long since the “little man” had good representation in West Bay and he intends to change that. The West Bay boat operator is no stranger to the public platform, having been active in a number of campaigns affecting the people in his district and his industry recently, from the battle to ensure the boat operators' needs are met during the changes at Safehaven to his role in the battle to keep the West Bay Road open. Ebanks was also at the forefront of the campaign to protect the North Sound in the face of the former premier's plans to dredge a channel through it. Having already started his campaign in West Bay, Ebanks says he has received a warm welcome from the district as the people are desperate for change. “It has been too long since the little man and the working class have had good representation in West Bay. I intend to change that. The people of West Bay have been taken for granted by their present representatives for too long. Dispensing political largesse every four years is not real representation. Where is the commitment to empower our young people, to strengthen families, to build our communities?” he asked. As the owner of a thriving fishing and snorkelling business, Captain Bryan said the tourism product, which is supposed to be a Cayman experience, needs more Caymanians to be involved. 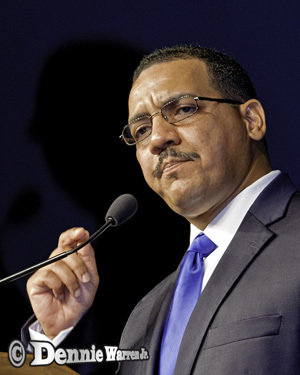 Party Leader Alden McLaughlin said the Progressives were pleased to have Capt. Bryan aboard. “He represents the spirit of every Caymanian. He has worked hard to become a successful entrepreneur and with his experience he has a lot to offer to our young people in particular in this regard,” the opposition leader added. Bryan Ebanks is the fourteenth person to join the PPM slate of an anticipated 15 as the party leader has stated that the Progressives can work with both their former colleague Arden McLean (East End) and the North Side Independent MLA Ezzard Miller and therefore will not field candidates against them. 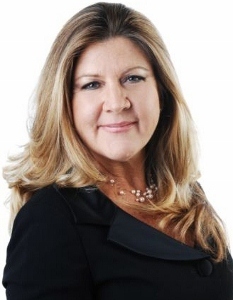 In addition, with the popular deputy opposition party leader, Moses Kirkconnell, and the new premier, Juliana O'Connor-Connolly, the only candidates in the Sister Islands race at present, the PPM will not be fielding a second candidate for Cayman Brac and Little Cayman. (CNS): a local supermarket and the private sector tourism association are teaming up to host the first Lionfish Tournament in Cayman, which will take place on Earth Day. 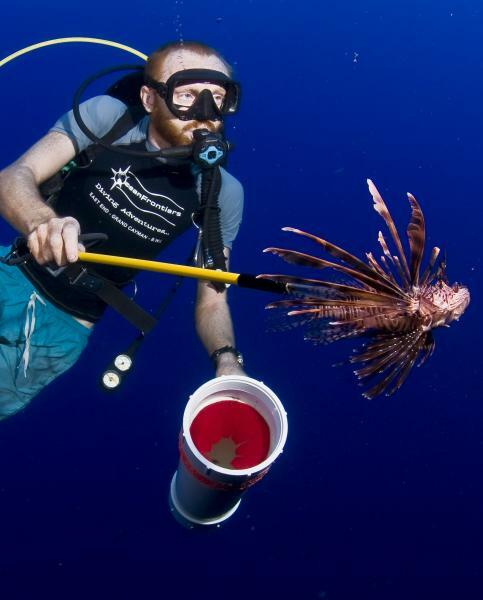 The goal is to cull lionfish from local reefs as a part of the efforts to fight the invasive species, which is now prevalent in Cayman waters and threatening the native marine life and diversity of the reefs. CITA and Foster's food Fair are hoping to partner with restaurants and watersports companies so that the fish caught in the tournament can then be served up for dinners in the evenings of the two day event. Organizers hope people will visit their favorite participating restaurant and enjoy the variety of ways lionfish can be enjoyed. Restaurants are being asked to sponsor a culling team with a CI $300 investment and then each restaurant sponsor will receive 75% of the fish that is caught by their team, with the remaining 25% going to Foster's. Sponsors and watersports operators team up to put together a culling team of six licensed cullers. Then during the 24-hour time period from 5pm on Friday, 26 April to 5pm on Saturday, 27 April the cullers hit the oceans and hunt for the pesky fish. A weigh in will take place at the end of the tournament with prizes awarded for the winning restaurant with the largest catch, the biggest lionfish in length and the largest cull in weight as well as the smallest lionfish in length. Foster’s Food Fair has supported community lionfish hunts for more than a year, with an initial grant of CI $20,000 to CITA to help encourage operators to cull lionfish. The fish is sold in the seafood department at Foster’s stores. Almost every time Fosters has received a delivery of lionfish it has immediately sold out, demonstrating that Cayman is keen to eat the fish. Given that over fishing works, the goal now is to get everyone to pick the pest as their fish of choice and begin to rid Cayman waters of the serious threat. For full details and information about the registration for restaurants and watersports companies, visit www.cita.ky/lionfishtournament2013. Members of the public are encouraged to contact their watersports operator of choice to register their participation. The engineers of these impressive telescopes are Jordan and her Dad Kevin Butler, Dr W Veit and Richard McLeod, Eric Cronier and his son and, Jason Blitzstein. 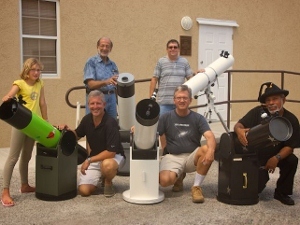 The course ran parallel with the basic Astronomy course at the Observatory taught by Chris Cooke and Richard McLeod from the Cayman Islands Astronomical Society which means the students also now know what to look for with their new instruments. (CNS): A public spat between the premier and her chief officer appears to have been resolved and the local agricultural society has received its regular $20,000 from government as a contribution to the Agricultural Show. Juliana O’Connor-Connolly described the removal of the cash from her ministry's budget as “very unfortunate” and reiterated government’s commitment to the annual show. O’Connor-Connolly had publicly criticised her senior staff on Radio Cayman last week regarding the issue but she said since then she had met with her chief officer, who had apologised and explained how the error had occurred.Speaking at the government press briefing on Thursday, she said that Chief Officer Alan Jones had been away when the situation arose and it was not actually Jones who had removed the funding, but he took responsibility as he too was annoyed but had found the $20k for the society at the 11th hour. The premier, who is also the agriculture minister, admitted that she had been unhappy about the situation and she had expressed her feelings about it. But following the explanation and a certainty that it could not happen again, she said the situation was resolved, the air cleared and the society paid. O’Connor-Connolly said that she was only made aware of the missing cash on the day of the show, which took place on Ash Wednesday, 13 February. 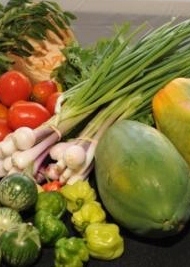 The money, which is an annual grant, covers some of the cost of the show held in Savannah at the Department of Agriculture’s grounds in Savannah. This year’s showattracted some 8,000 people, where she said an enhanced product had been on show from local farmers, along with a diversification into crafts and other things. The premier said she was pleased to see the level of camaraderie amongst the district farmers rather than competition, despite the battle for the ribbons on offer for livestock and produce. See more about the show and results on Facebook. (CNS): The strict secrecy of what goes on behind Cabinet’s closed doors may soon be relaxed, according to the deputy premier, who says that he would like to see government publish a Cabinet newsletter. 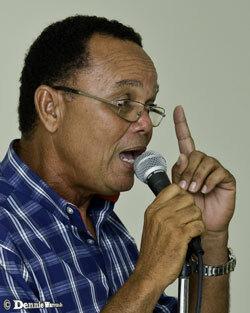 Rolston Anglin said at a public debate at the UCCI last week that he believed the twenty year restriction before details and documents from the inner government circle meetings can be released is too long, and on Thursday he said that, while actions from Cabinet eventually come into the public domain through the gazette, laws or public policy papers, it would be far better to release the information in more cohesive way. Speaking at the weekly press briefing, he said that most of what happens in Cabinet could easily be made public after the meetings, summarising the key issues. While issues that related to national security or were commercially sensitive should remain under wraps, Anglin said there was no reason why much of the rest could not be in the public domain in some form of journal or minutes. Anglin said he did not know why such a policy had not been implemented during the last three years that he had been in Cabinet but he said he had put the idea forward, adding that the blanket twenty year ban on the release of all information was too long. While a lot of what happens in Cabinet meetings, such as regulation changes, are eventually reported via the gazette, in a time of more open and transparent government the public should not have to wait for that when government could easily share timely and significant information in a more comprehensive manner, he said. “Why have such a piecemeal approach?” he asked rhetorically. During the UCCI debate Anglin said the Cabinet needed to reform the legislative framework towards a right to know environment and all ministries should be publishing more information and not waiting on freedom of information requests. He also said the minutes of all public authority meetings should be published. Whether or not there was support for the idea of more openness during the past administration, it appears that if the next government is made up of independents, the opposition, the new interim members or a mix of all three, the issue could gain traction, since most of the candidates who took part in the UCCI debate on Wednesday night supported the release of Cabinet information. Wayne Panton, who is running with the PPM in Bodden Town, pointed out very succinctly why government should be far more transparent, including revealing what happens in Cabinet to the public. “It’s about the people’s business,” he said. Currently, Cabinet is made up of the five elected government ministers, plus the governor, his deputy and the attorney general. When the group meets it decides government business, such as which laws will go to the Legislative Assembly and government policy. Some decisions are discussed in public almost right away when they become policies or plans, such as the recent national health and national education strategies. Laws also become public documents, as do regulation changes, when they are gazetted. However, the Cabinet does not publish its agenda or minutes and discussions and deliberations usually remain secret. (CNS): The UK’s overseas territories minister has given in to the pressure from elected officials in the Turks and Caicos Islands not to introduce VAT. Mark Simmonds wrote toboth Premier Dr Rufus Ewing and Opposition Leader Sharlene Cartwright-Robinson stating that he would instruct the local governor not to sign the order which would have introduce the sales tax to the territory on 1 April. However, Simmonds makes it clear that the new government will need to find the money from somewhere to produce surplus budgets and find its own way to replace the loan guarantee from the UK by 2016. Simmonds said it was the Turks government that would be held accountable for the country’s finances and he was not about to allow a reversal of the progress made by the previous UK-led interim government. He said that to prevent that reversal the TCI government would face more difficult choices to ensure stable and sustainable revenues and expenditures in the absence of VAT. The FCO minister told Ewing that his opposition to VAT made him responsible for the consequent decisions to ensure the fiscal health of the islands' public finances and he would be held accountable. He said that the UK still believed that without VAT the tax burden in TCI would fall on a smaller number of businesses and households and the TCI would need to take further steps to cut spending to achieve the necessary surplus budgets as agreed in the local agreement regarding fiscal responsibility. Simmonds said the UK would be keeping a very close eye on the public purse and the UK would not accept a return to the previous dire financial situation. The British minister also criticised the local politicians for the use of a private members bill to overturn the VAT legislation. He said that he would not allow the governor to assent to that bill but instead he would be directed not to sign the order on the VAT legislation, which would prevent the sales tax from being implemented. He also took aim at what he described as the vitriolic public attacks in TCI recently on the judiciary and public servants and called on the premier to condemn the unacceptable level of debate. Although an elected government has now been returned to office in TCI, the relationship between the new politicians on both sides of the Assembly and the UK government and its representatives in the jurisdiction has deteriorated. The local government has accused the British of continuing to take a colonial approach to the territory and undermining the democratically elected officials. In a CNS report last year, a former inmate revealed how he was able to use individual wrapping papers given to him by security guards at the jail as currency for snacks and cigarettes. In the wake of more revelations recently by the UK prison inspectorate about the use of drugs in Northward, a concerned citizen queried the position of the portfolio, which is responsible for the facility, over the apparent contradiction about wrapping papers. Although they are no longer sold on prison property, the papers are still coming into the prison lawfully through the hand-in system. In a letter to Eric Bush, the member of the public said he was aware that the deputy director of Northward Prison had defended allowing the continued hand-in of wrapping papers as the possession of the papers was not an offence. Permitting papers into the prison was, the writer said, facilitating the use of ganja in the prison and demonstrated the "utter futility" of the RCIPS and the courts going through the motions at great expense to the public purse to incarcerate people for drug offences if the authorities continued to turn a blind eye to the use of drugs once the people were locked up. The author also pointed to the “unacceptable waste of money” for the Caymanian taxpayer to continually warehouse at any one time about 200 drug users on a rotational basis. The portfolio head has now confirmed that the papers will no longer be allowed, as he agreed that the items do nothing to assist with the rehabilitation or security of inmates and may contribute to illegal activities. However, other sources have told CNS that any blanket ban on papers will just increase their value in the prison as they, along with the drugs, will continue to be smuggled in as the drug use continues. 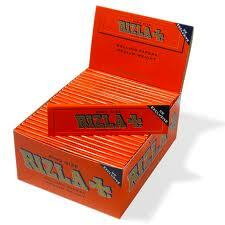 With little rehabilitation and some inmates incarcerated and criminalized because of their habit, the drug problem in Northward is unlikely to be resolved by the banning of Rizlas.